If It's Hip, It's Here (Archives): Packaging Geography. 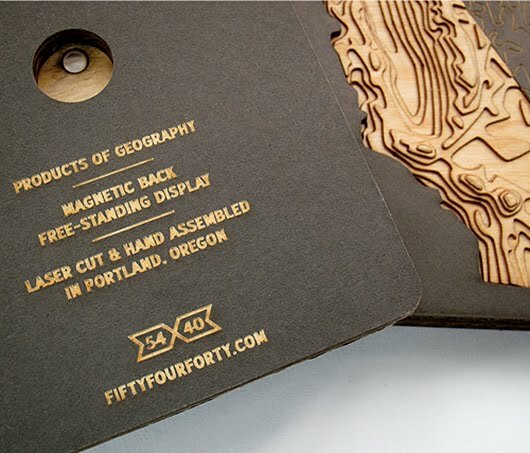 Laser Carved Topographic State Magnets Are Beautifully Presented In Unique Package Design. Packaging Geography. 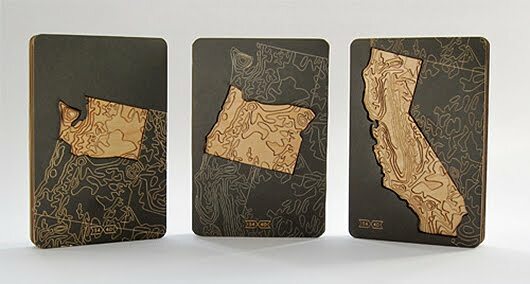 Laser Carved Topographic State Magnets Are Beautifully Presented In Unique Package Design. 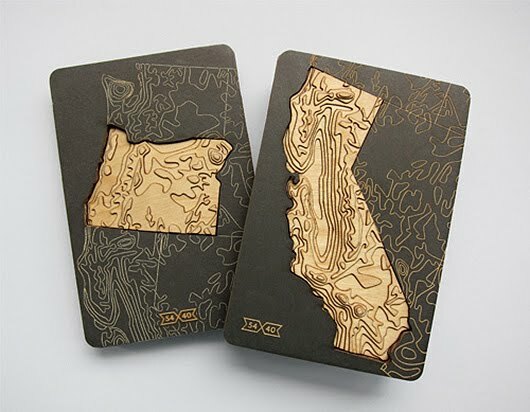 Mette Hornung Rankin of the Bureau of Betterment and Greg Jones of Fifty-Four Forty have collaborated on this set of laser cut topographic US State magnets and the prototype packaging for them. 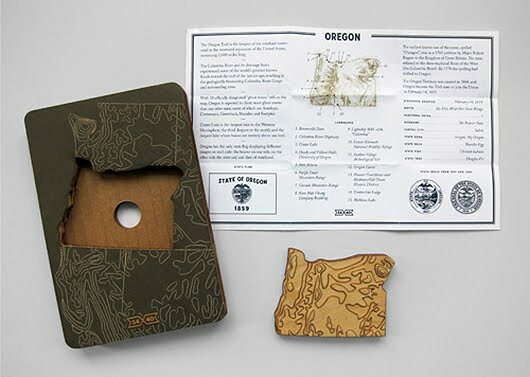 Set inside chipboard whose printed design mimics the surrounding area (and doubles as a display stand), each magnet-backed state carving is accompanied by a small folded two-sided pamphlet with facts and engravings. "My dad was a geography teacher, so growing up in a small town in Central Oregon my family participated in the local radio station’s morning Geo Quiz with the 3 other families in town who were also partial to such shenanigans. Over the years of answering questions correctly I collected a world placemat, spin-top globe pencil, globe keychain, and numerous stickers and erasures. While the days of the Madras Radio Geo Bee are long gone, I still have a fondness for geography related trivia. 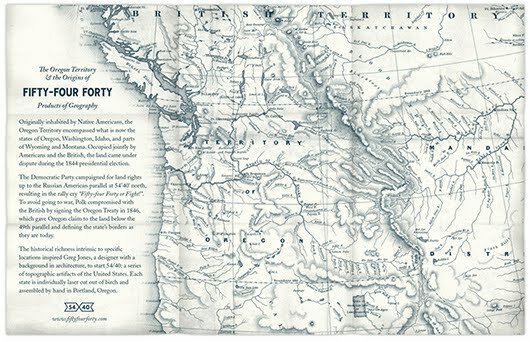 So when I met Greg Jones at an ADX Feedback Loop event where he presented an idea for a topographic series of state products, I was psyched to help him make it a reality. 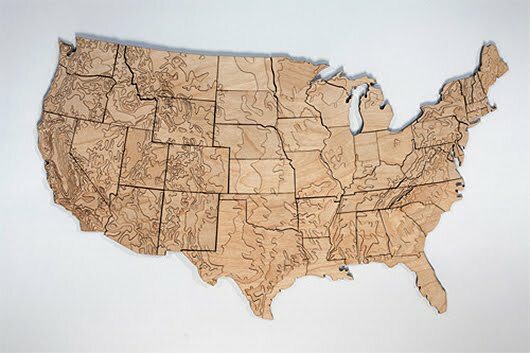 After some talk, we decided to collaborate on packaging prototypes for a small batch of products he wanted to sell to gather interest in his idea: a set of magnetic-backed US states made out of laser cut wood that show the topography of America. AWESOME!!! The packaging structure was inspired by the jig used to assemble each state. A piece of charcoal colored chipboard is sandwiched between layers of thick cardboard that mimic the topographic nature of the product. 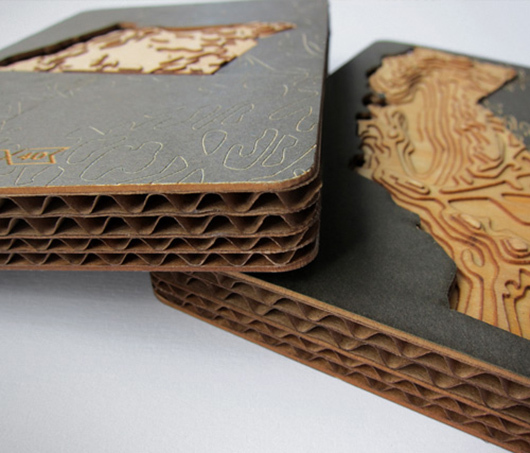 The front of the packaging is laser cut with the pattern of surrounding states while product information is shown on the back panel. The product is easily nestled into its’ own shape with a small finger hole on the back to help pop it out for use. The packaging doubles as a free-standing display for the state. 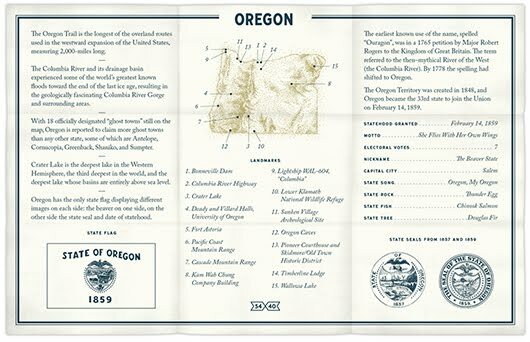 To highlight each state’s unique attributes, a small pamphlet with state facts was created with images and notable geographic landmarks. The pamphlet folds in 3 each way and slides into a recessed slit on the back side of the packaging structure, making the product and packaging a fully integrated solution. This project was in collaboration with Greg Jones from 54-40, logo design by Ashley Stevens, a designer I worked with previously while at Morrow McKenzie Design. ADX is a Portland-based community space for makers to use various large-scale equipment and resources to make their own products. ADX also hosts a variety of events and classes."